ASDIP STEEL is a structural engineering software for the design of structural steel members. It includes the design of shear connections based on the AISC 360 provisions. This document is a step-by-step design example of a real-life beam to girder connection..
As an example, consider the partial framing plan shown below, which is part of the second floor of a storage building. The first level will have retail spaces, so the second floor includes a series of transfer beams and girders to support the columns of the upper levels. The member sizes have been specified. 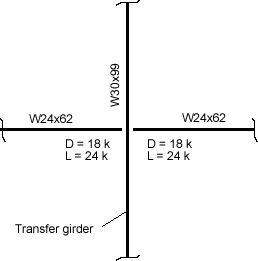 Design the connection of the beams to the girder for the given reactions. There are several connection options:: a) Double angles - Since there are beams at both sides of the girder, the bolts will be common to both sides. This means that both beams would have to be erected simultaneously, which is difficult. b) Single angles - The angles could be staggered to avoid the common bolts. In this case each beam would be connected independently. c) Single plate connections - Independent erection of the beams. In this example we will use the single angle connection option, with the angles welded to the girder and bolted to the beams. 1.- Enter the known information, such as the support member size. The connection will be to a beam web. The At-a-Glance tab shows a summary of the design for a quick overview of your work as you go. Note that ASDIP STEEL shows the applicable limit states with a pass / fail indicator. Likewise, it shows the loads combinations and the applicable design checks. With this information it's really easy to identify the controlling limit state and load combination. 2.- Enter the beam size, given in the problem statement. Since the beam will be connection to a girder matching the top of steel, it's necessary to cope the top flange. This is important since some special limit states apply to coped beams. The Condensed tab shows a more complete set of results grouped by topic, great for a more detailed overview of your design. Note it presents more useful information, such as the controlling limit state and load combination, etc. 3.- Enter the connector properties. This includes the angle size, eccentricity to the beam CL, and edge distances to the bolts. 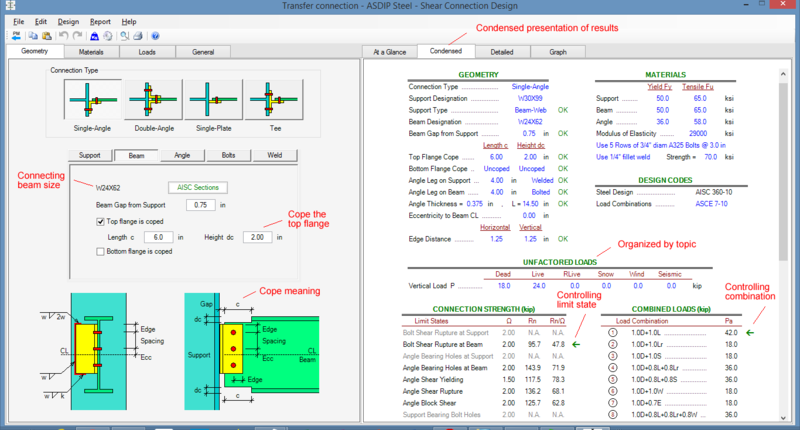 ASDP STEEL lets you specify if the angle is bolted or welded. In this example the angle will be shop welded to the girder and field bolted to the beam. This will avoid the simultaneous erection of the beams at both sides of the girder. The Detailed tab shows a complete set of step-by-step calculations with exposed formulas and with references to the AISC code. Note that the calculations are organized by topic, and per limit state, for a granular checking of the results. 4.- Enter the loads given as beam reactions in the problem statement. ASDIP STEEL lets you specify either a single pre-combined load, or a set of load cases, In this example the known loads are by load case, and will be combined per ASCE 7-10. The design can be either per ASD or LRFD. 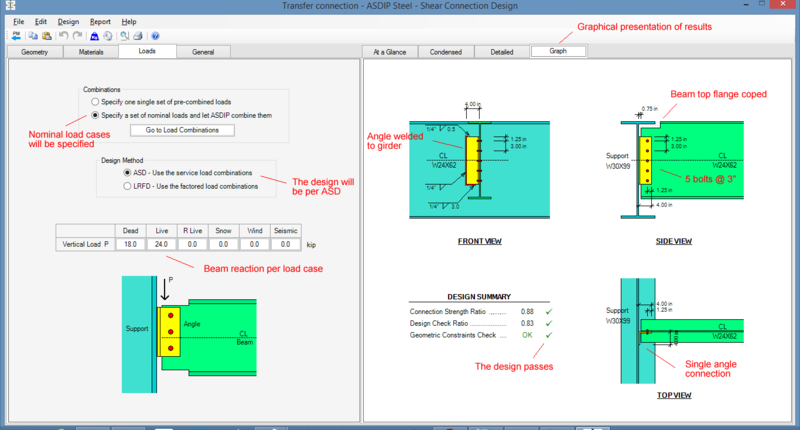 The Graph tab shows graphically the connection details in front, side, and top views. Note that the top of the angle is not welded to the girder. This is to provide more flexibility and allow the connection to rotate. The design summary shows the satisfactory results. ASDIP STEEL includes the design of different types of shear connections, with multiple options to model and optimize the design easily. This real-life example shows that the design can be completed and optimized within minutes. 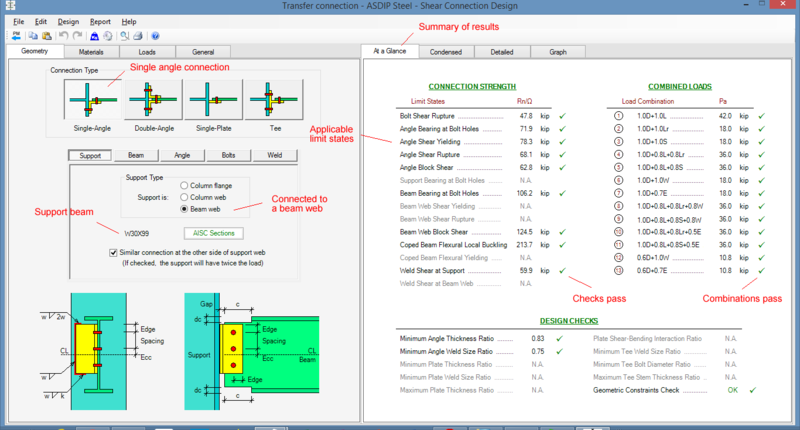 For engineering background please read the article Shear Connections: Overview of the Design Process. 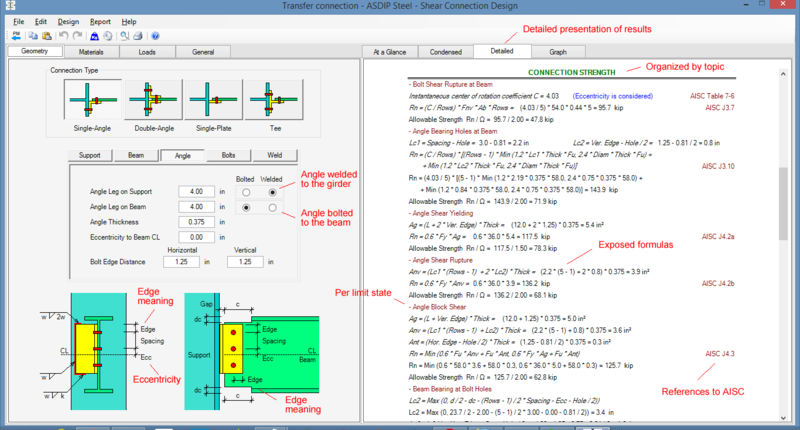 Detailed information is available about this structural engineering software by visiting ASDIP STEEL. You are invited to download the Free 15-day Software Trial, or go ahead and Place your Order.